Epsom Male Voice Choir has been singing together since 1983 and today is one of the leading men's choirs in the South East, drawing members from a large area. 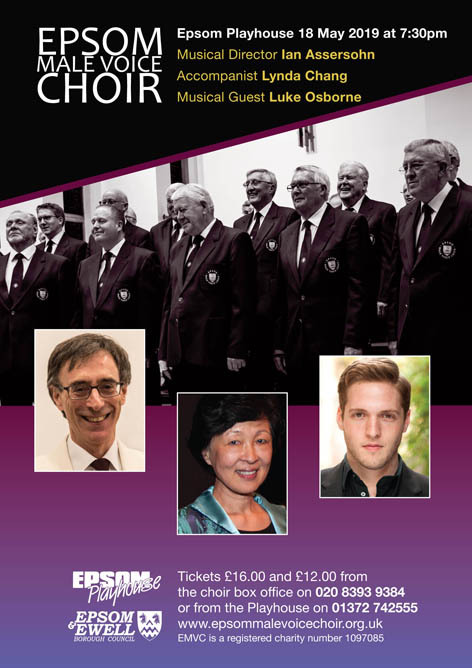 Our repertoire is wide, and includes contemporary compositions and arrangements (many written specially for us), music from around the world, pop, folk and musical theatre, as well as the traditional Male Voice Choir repertoire. We have sung at a wide range of venues including the Albert Hall, the Royal Festival Hall, Truro Cathedral, Dorking Halls, Fairfield Halls, Epsom Playhouse and many local halls, churches and others. Rehearsals are held in the United Reformed Church Hall, London Road, Ewell, Surrey on Wednesday evenings at 8.00 pm. New members are always welcome. No prior experience knowledge of music is required - just enthusiasm and a willingness to learn to sing with others.